The Fall 2018 Edition of the Manitoba Association of School Superintendents (MASS) Journal produced an article that highlights the impact Reading Recovery has had in Manitoba over the past 25 years. A remarkable journey in Manitoba to help those struggling the most to learn to read and write began in 1994. Since them over 380 schools in Manitoba have implemented Reading Recovery. Read the entire article on page 17 of the MASS Journal. Currently there are 310 teachers in Manitoba trained to provide Reading Recovery in their schools, but when all of the teachers who are Reading Recovery trained the number jumps to over 2400 teachers with a significant early literacy expertise sprinkled throughout the province. These teachers participate in a year long training and are challenged to consider new perspectives and see the lowest achieving children as full of potential, utilize the child’s strengths and interests while linking theory with practice. To date, over 51,000 students in Manitoba have made progress and received the benefit of Reading and Writing at a young age! 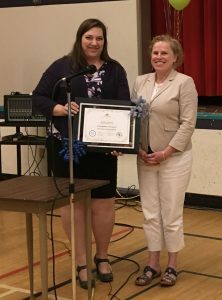 In recent years, Reading Recovery has expanded to Manitoba’s First Nation Schools – you can read more about the impact Reading Recovery is having in Manitoba First Nations Education Resource Centre schools in this post. To celebrate the achievement of this milestone join us at the National Reading Recovery and Early Literacy Conference in Winnipeg, April 4-5, 2019. 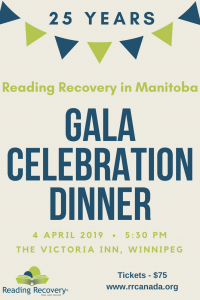 On April 4, 2019 we are hosting a Gala Celebration Dinner where you can hear from former students, Reading Recovery Teachers and those involved in making a difference in the lives of over 51,000 students and their families. Are you a Principal or Vice-Principal responsible for the implementation of Reading Recovery in your school? Would you like an amazing reference guide to assist you in understanding Reading Recovery and supporting your Reading Recovery Teachers so that your young students can achieve success in reading and writing? The Canadian Institute of Reading Recovery is delighted to announce the publication of A Principal’s Guide to Reading Recovery in Canada (2018). 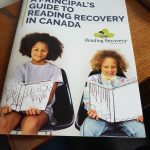 This 80 page, full colour guide recognizes the key role that principals play in ensuring success for Reading Recovery Students and Teachers in their schools. This invaluable guide is $10 and can be pre-ordered now. We are accepting bulk orders for this book from school districts who complete this order form. Orders will be filled by mid-December. We encourage school districts to purchase copies for each of their Principals, Vice-Principals and other School Administrators as well as a few extra copies for future needs. Orders will be shipped directly to the district. The book can also be downloaded at no cost for use on your electronic devices. 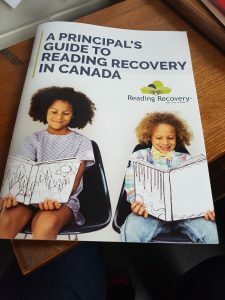 We thank the Canadian Reading Recovery Trainers (Jennifer Flight, Christine Fraser, Yvette Heffernan, Allyson Matczuk, and Janice Van Dyke) for their work in editing the content of this guide and ensuring that it is a very useful document for years to come. Reading Recovery is money well spent! We often hear from professionals in school districts who say that they cannot implement Reading Recovery because the cost is too high and that it requires too much teacher time. A new article from the Canadian Institute of Reading Recovery explains that investing in Reading Recovery is not as expensive as you might think. The article includes a descriptive chart to compare the costs of delivering Reading Recovery with small group literacy intervention, resource support and grade retention. It highlights that Reading Recovery is an intervention that not only targets reading but also writing in less time and with greater success at less cost than small group literacy strategies, resource support or the classroom teaching alone in Grade 1. 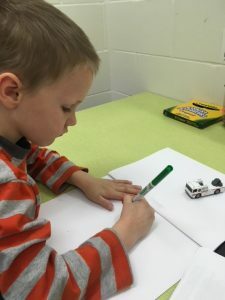 An added benefit to Reading Recovery is not only the inclusion of writing but also the training and on-going professional development that teachers receive. Teachers receive high quality training in order to work with students, track student progress and design individual lessons to ensure the best possible learning environment. Teachers have reported that the training and on-going support is some of the best professional development they have ever received. These trained teachers are able to support literacy learning for the entire classroom. The true cost of not implementing Reading Recovery is that young students do not learn to enjoy learning or develop a curiosity about the world through books. They will struggle throughout their education and will often grow up to not have the self-confidence needed to learn to read well later in life. Offering Reading Recovery to the lowest achieving students in Grade 1 is an investment in the future of children and the future of our communities. A copy of this article can be found here. Teaching children to read and write involves the use of books that are suitable for their reading level, language and cultural relevance. Publishers and authors are invited to submit their books for approval. Once approved they will be added to the book list so that Reading Recovery schools can purchase them for use in their programs. Each book included on the Canadian Reading Recovery Booklist (CIRR, 2017) represents countless hours of volunteer work by Canadian Reading Recovery Trainers, Teacher Leaders, and Teachers who engage in an intensive review process that includes an initial review for quality and approximate level followed by field-testing of every title being considered for inclusion. Reading Recovery educators who support the processes of review and field-testing represent geographic, language, and cultural diversity. It is not the intent of the Booklist to provide an over-abundance of titles. The intent is to provide a listing of texts that Reading Recovery professionals can easily access for use with students. The booklist is revised on a 3-year cycle with the next date of publication being Spring, 2020. It would be advisable to have books distributed before December 31, 2019. In order to expedite titles for consideration, it is advised that publishers and book distributors provide complementary copies that can be distributed by the contacts in each region. In 1999, Jack, a student in Yukon, was at the lowest reading level in his class in Grade 1. 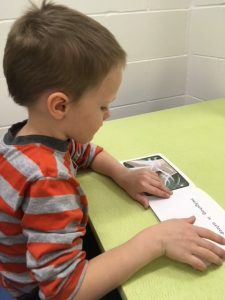 His parents were shocked to receive this news, but when offered the opportunity to have him participate in Reading Recovery, they gratefully accepted this offer of support. Following just a few weeks of the Reading Recovery literacy intervention in his school, Jack’s reading level improved dramatically. He finished his Grade 2 year at the highest reading level in his class. his learning and quickly catch up to his peers. room at the beginning of Grade 3 ready to continue his work with Ms. Marie! The short term intervention of Reading Recovery has made a difference for Jack. 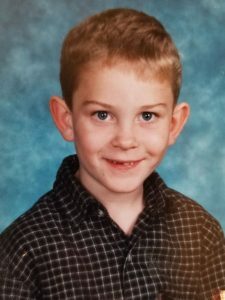 Throughout elementary school and high school, Jack was an avid reader and an above average student. In 2011 Jack graduated from high school with honours. Currently, Jack is finishing his Bachelor of Arts undergraduate degree at UVic and achieving A’s in his program. He is also an excellent writer and a voracious reader of global politics, biographies, and fiction anchored in history and travel adventures. Jack has come a long way since his beginnings as the lowest achieving reader in his Grade 1 class! Without the Reading Recovery intervention it is possible Jack would struggle with reading, writing and academic achievement throughout his education and into adulthood. The short time he spent with Ms. Marie in Reading Recovery has made all the difference for Jack. Parents of children who are struggling to read and write often wonder what they can do to help their children be better readers and writer. There are many things parents can do which can help young children with reading – read to them, give them books to read, point out letters and words you see in public, let them see you reading, take them to the library. Even with these activities some children will struggle to learn to read once they get into school. For these children Reading Recovery is an effective way, in a short amount of time to bring the kids who are struggling the most up to a level equal to the other readers in their grade. Not all schools have Reading Recovery though, so one of the ways parents can help is to advocate for the school board, division or district to implement Reading Recovery. Reading Recovery makes a life long impact! In 2014, the first Reading Recovery Training Centre in a First Nations community opened in Manitoba. The opening was cause for celebration. Gloria Sinclair, Reading Recovery Teacher Leader for Manitoba First Nations Education & Resource Centre. Gloria Sinclair was selected as the first Teacher Leader to guide the implementation of Reading Recovery. The winter issue of The Journal of Reading Recovery, features an article written by, Gloria Sinclair, Allyson Matczuk and Irene Huggins. 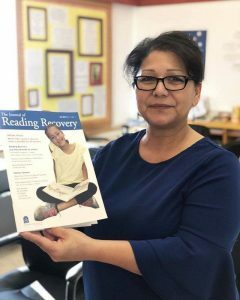 The article that reflects on the implementation of Reading Recovery by the Manitoba First Nations Education Resource Centre. Outlined are the details of how Reading Recovery has been implemented in an area that this made up of many small, rural and very remote communities. Read about the achievements of Ray, a student who could recognize only 7 letters and with only 12 lessons he read little books, wrote in full sentences and confidently answered questions about what he was doing! 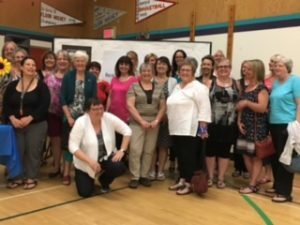 The implementation has been so successful that a second Teacher Leader has been trained and another Reading Recovery Training Centre has just opened in Thompson, Manitoba. Learn more by reading the full article.